Has anyone heard of the Meatless Mondays initiative? I think it’s an amazing idea, which is really easy to do and will make a big difference. If people all around the country, and the globe took part in meatless Mondays campaign not only would we be healthier but we would also be doing our part in saving the environment! Meatless Mondays is an international campaign which originates all the way back to WWI. Now that I think of it, I do remember learning this in history class last year… Anyway, it came back around in WWII but it was recently recreated as a public health awareness program in association with the Johns Hopkins Bloomberg School of Public Health’s Center for a Livable Future. Recently the campaign has earned lots of publicity through the endorsement of celebrity chef Mario Batali as well as Sir Paul McCartney and Gwyneth Platrow (to name few!) It’s gained more publicity through respected news outlets such as CNN, The Los Angeles Times, Macleans Magazine, The Toronto Star, The New York Times, The Times Of India, The Atlantic, and The Washington Post. If you wish to see what they said about “Meatless Mondays” click here. I have decided to endorse this initiative and have planned it into my weekly menu! 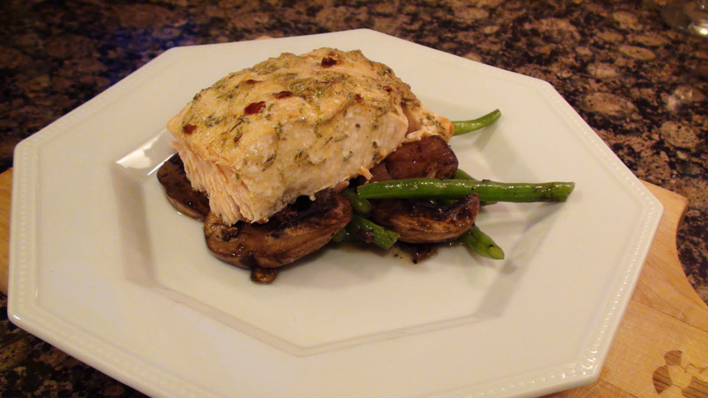 As for today’s meatless dinner… French Roasted Salmon, with garlicky green beans and mushrooms! Really a pretty simple and basic, yet extremely delicious and satisfying meal! The recipe for the salmon is my own adaptation off of the “French Roasted Salmon” recipe from besthealthmag.ca. I have to say that this is seriously, without a doubt, the best salmon I have ever had. Preheat your oven to 450° F. Grease an oven safe dish with a little olive oil to avoid the salmon sticking. Combine all of the ingredients together in a bowl and whisk them together. Place your salmon in the dish and season with sea salt. Brush the tops and sides of the salmon with the garnish you have just prepared. Bake them in the oven uncovered for 12 minutes. Once the 12 minutes is up, turn the oven off, cover the salmon and leave them in there for about another 8 minutes! And voila, you should have mouth watering, perfectly cooked salmon! And there you go! Delicious salmon! Nice post, but I have one criticism. Salmon is fish. What do you think fish is? A vegetable? How can you include that recipe for 'Meatless Monday' when it clearly contains salmon? Salmon is fish. Fish is meat! Holy sweet Mother of Pearl, that looks delicious! And I love the idea of Meatless Mondays. We usually only eat meat once or twice a week at our house, at the most, but I know others (like my parents) who could use a meatless day once in a while, lol. "Fish is NOT meat!" Never has been...Never will be..."
It is meat, and for whatever reason people apparently disagree. It comes from the flesh of an animal. Fish is meat, just like pork, chicken, beef, etc. How hard is that to comprehend?